A brief summary of the most important issues and turning points in the Spanish revolution and civil war from a perspective sympathetic to the anarchist left wing. The unprecedented world crisis of the 1930s exacerbated the class struggle in various European countries and gave rise to revolutionary situations that led their ruling classes, disenchanted with the parliamentary system, to opt for dictatorship and fascism. A series of unsuccessful revolutionary uprisings took place in Spain during the Republican period. The working class, seeking to obtain civil rights and to secure the release of its imprisoned comrades, decided to support, actively or passively, the weakened liberal sector of the bourgeoisie, knowing that the majority of the ruling class would never accept an electoral victory that benefited the proletarian organizations. The victory of the Popular Front was expected to lead to a coup d’état to establish a fascist dictatorship; CNT and anarchist speakers were constantly warning that after the election the choice would have to be made between fascism and revolution. It was in this psychological context that the military uprising, based in Africa, took place, which relied at first on the advantage of the initial passivity of the government, which absolutely refused to distribute arms to the people, and which did nothing to take advantage of its naval superiority to block the transport of the African troops who occupied Western Andalusia and Estremadura and committed horrible massacres. The workers replied with general strikes and barricades, and wherever they had armed defense groups, they attacked the barracks and formed militia columns to liberate the towns and cities that had fallen into the hands of the rebels. In the Loyalist zone, the correlation of forces was profoundly altered. Local governments were replaced by Committees that assumed responsibility for regulating the affairs of everyday life. Although the forces of Public Order were not dissolved, their functions were transferred into the hands of improvised committees, “mobile brigades” and patrols. All prisoners were released from the jails and prisons, including common criminals, and the prisons began to fill up with priests, right wing elements and fascists. Furthermore, each organization had its own detention centers. Outside of the organizations, “uncontrolled” groups emerged behind the lines that were devoted to robbery, extortion and murder, and these groups were rapidly exterminated. The trade unions took over public and religious buildings, while the monasteries and convents, bull-fighting arenas and barracks were used as recruitment centers and storage depots for clothing, food and equipment for the militia columns that were being sent to liberate the zones that had been seized by the rebels. Automobiles were requisitioned for military purposes, and the property of those persons who had fled or were in hiding, and the printing presses that printed conservative and right wing newspapers, were also confiscated. A deep rooted system of workers control was established in the factories for the purpose of preparing for their expropriation, rural agricultural tracts were collectivized and socialization seemed to be imminent. Speculation and food shortages were prevented by means of market controls. And the hotels, bars and restaurants, hospitals, barber shops, theaters, etc., were also collectivized…. People’s dining halls were created, schools were formed, and the trolleys were emblazoned with the colors and slogans of the proletariat. On the airwaves, the voices of the workers delegates were broadcast far and wide. Meetings and conferences where the political, social and military situation was explained, and the pertinent directives were issued, were attended by vast multitudes. On the streets, one saw only working class attire (overalls, bandanas and militiamen’s forage caps). The standard gesture of greeting was the raised fist. The militia columns, while they were on leave, assisted the peasants in their work in the fields, helped organize committees, socialized goods and services, and proclaimed libertarian communism in the liberated areas. The sudden changes that erupted in society in July and August clearly marked the beginning of a profound social revolution that did not come to a halt after merely transforming external political appearances. Recent events testified to the fact that the republican legal framework was incapable of resolving even the smallest problems that arose, much less of addressing and controlling the popular maelstrom unleashed by the fascist military revolt. Despite the fact that, in practice, power was in the hands of the workers organizations, the republican institutions were not dismantled. The bourgeois State still retained its body, even if it had been deprived of its vital force. All the elements of the counterrevolution—policemen, Civil and Assault Guards, judges, bankers, professional intellectuals, conservative journalists, etc.—who, for one reason or another, had remained loyal to the Republic, were waiting for the revolutionary wave to subside so they could recover their former positions and then, organized in the left-wing parties and trade union organizations, confront the revolution. Because the PCE [the Communist Party] opposed the revolutionary course taken by the working class and openly displayed its determination to strictly adhere to the pre-July 19 republican framework, especially with regard to the question of private property, it became the safe haven of all the enemies of the social revolution. The proletarian offensive stalled on the outskirts of the major cities of Aragon and in the Sierra de Guadarrama, and it was defeated in Granada, Seville and Cordoba. Mallorca, Galicia, Old Castille, Vitoria and Pamplona fell into the hands of the rebels. The landings of African troops in Cadiz opened up the road to Madrid, where all the rebel forces were focused. There, the militiamen had to face not just simple Civil Guards and fascist fanatics, but regular army soldiers and shock troops like the legionnaires and Moroccan units, which were better equipped and supplied than the other rebel units. The Spanish capital therefore absorbed almost all the available military hardware and supplies of the Republic, paralyzing all the other fronts. It was obviously necessary to put an end to the phantom existence of the State and to form a proletarian army on the basis of the militia columns—the people armed—an army that would be capable of defeating the rebels in battle, consolidating the proletarian conquests, and driving the revolutionary process forward. The only force that had resolved to proceed in this direction was the CNT, and even in the CNT this position was not unanimously supported, as a large number of its representatives were in favor of collaborating with the other political forces, whether bourgeois or proletarian, in a republican government that would be the legitimate heir of bourgeois legality. The CNT had just reincorporated within its ranks the reformist sector of the Confederation at the Zaragoza Congress (the treintistas), but it was the responsible committees that made this decision, without the support of a real majority of the membership. The libertarian leaders who were committed to collaboration performed a precarious balancing act with regard to their rank and file base by upholding and coordinating its conquests while simultaneously explicitly renouncing the struggle for libertarian communism, which was the ostensible goal of the confederal organization, and the “go for broke” strategy, that is, the seizure of power. This difficult position led them to participate in the inter-classist regional governments that were created to assume responsibility for the functions of the institutions that the uprising had rendered obsolete, and they engaged in many initiatives whose goal was to achieve practical unity with the UGT and the loyalist parties. The fascist victories led to the socialist Largo Caballero’s appointment as Prime Minister, and although Caballero did not yield to the pressure of the CNT to form a government council composed exclusively of trade union delegates, he did offer them four Ministerial portfolios instead. The entry of the CNT in the Government served as a fig leaf to cover its transfer to Valencia. In the meantime, the war had taken on international dimensions. The great powers, afraid that the revolution might spill over into their territories, signed a Non-Intervention Pact that forbade its signatories from engaging in the slightest effort to help the Spanish Republic. The military superiority of the rebels, who relied on the support of Portugal, Italy and Germany, left no other option than to depend on the Soviet Union, the only world power that was willing to help the republican side. The hopes placed in the Soviet Union gave a major boost to the fortunes of the PCE, which increased its proportional representation in government institutions far beyond the magnitude of its real membership. It immediately became the spokesman for all the parties that had been harmed by the revolution. At first, it supported Largo Caballero’s initiatives to reinforce the State apparatus and to create a “people’s” Army with a centralized command structure. The decrees mandating the restoration of the municipal governments, the disarmament of the rearguard and the militarization of the militias, implied the rehabilitation of Government power and the end of the power vacuum that had allowed the revolution to thrive. The creation or expansion of various police forces and the formation of mixed brigades were intended to contain and undermine the revolutionary process both behind the lines and at the front. The new civil governors, supported at all times by the communists, clashed with the autonomy of the committees, the collectives and the militias. Bloody incidents took place in Guadix and Valencia. The libertarian leaders proved to be fervent advocates of militarization, the restoration of the authority of the municipal government bodies and the disarmament of the rearguard, as well as participation in government institutions. The editorial committee of Solidaridad Obrera was replaced by another group of editors who were more amenable to promoting the official, statist and pro-Soviet political line. It did not take long for the newspaper to proclaim that the civil war was not a class war, but a “war of independence against the invader”, as the PCE said, and it became the champion of “unity”, discipline and respect for the military brass. Durruti was sent to Madrid at the behest of Soviet agents to reduce the power of the anarchists on the Aragon front, and he was persuaded by his comrades in the highest echelons of the CNT-FAI that if he went to Madrid he would obtain adequate supplies. A “stray bullet”, or maybe one that was not so stray, killed him, but Madrid was saved. The lifting of the siege of Madrid was attributed to the International Brigades, whose ulterior purpose was to serve as a counterweight to the anarchist militias. The death of Durruti on November 20, 1936 removed an important obstacle to militarization, allowing the invention for political purposes of the public image of a military chief ready to renounce “everything for victory”, according to an editorial published in Solidaridad Obrera in February 1937. With this phrase the responsible committees of the libertarian movement inaugurated the circumstantialist doctrine of support for the State and renounced their principles, tactics and goals. The fall of Malaga in early February was only an additional pretext for the further confirmation of this policy. The Peninsular Committee of the FAI began to take measures to transform the FAI into a political party, with hierarchies, statutes, membership cards and dues, engaging in all kinds of verbal gymnastics in order not to clash with the interests of the various power centers that had formed within the new libertarian bureaucracy, and also for the purpose of marginalizing the affinity groups that were resolved to continue to operate as they had in the past. In fact, what this amounted to was an attempt to create the political superstructure for a newborn bureaucracy at the expense of an incomplete revolution, a necessary factor for the political and trade union plutocracy of the republic, the new bourgeoisie that had come to replace the old bourgeoisie. Paid positions in this bureaucracy also conferred privileges such as having access to basic goods that had disappeared from the market, the use of a private automobile, and perquisites such as opportunities to dine in luxury restaurants and elite nightclubs, and to attend banquets and theatrical shows. Fur coats, tailored suits, neckties and the kinds of hats worn by the upper classes were once again seen on the streets. The offensive against the anarchists was being consolidated: the discovery of the Cheka of Murcia, the assassination of the members of the collectives at Torres de la Alameda, the arrest of Maroto, the suspension of the libertarian press (Nosotros, Castilla Libre, CNT Norte), the incidents at Vinalesa and Gandía…. As the counterrevolution advanced and the divorce between the libertarian leadership and the rank and file militants of the libertarian movement was consummated, signs of dissent and radical opposition appeared (The Friends of Durruti, the Libertarian Youth of Catalonia, the Local Federation of Groups of Barcelona, the journal Ideas, the bulletin Alerta!...). The leadership of the CNT-FAI convoked a conference of the editors of the movement’s publications to impose a single political line. In July, a Political Advisory Commission was formed to control discordant views. It is obvious that a strong reaction on the part of the international proletariat against its respective governments would have put an end to the Non-Intervention Pact and thus facilitated loyalist Spain’s access to arms. The end of dependence on the USSR for arms supplies would have curtailed the otherwise inexplicable influence of the PCE, the penetration of Russian advisors in the Army and the unbridled activity of the Stalinist secret services. It would have also rendered the capitulationist orientation of the confederal and anarchist leadership towards the State much more difficult. Without the preponderant Russian role, the doors for open dissent against that orientation would have been pushed wide open. But the solidarity actions of the international proletariat were insufficient and the revolution could not be consummated. The Battle of Guadalajara preserved the balance of forces on the military fronts, buying just enough time for one last provocation for the purpose of removing Largo Caballero from the Government (he was opposed to communist dominance), putting an end to the excessive influence of the CNT-FAI, liquidating the achievements of the proletariat (which had already been significantly attenuated), putting the POUM behind bars and proclaiming open season on all revolutionaries. The communist plot found its most reliable allies in Catalonia, and it operated through them. The communists tested the waters with the theft of some tanks in Barcelona and the assassination of Antonio Martín in Puigcerdá, and then openly launched their attack on May 3 with the attempt to occupy the Telephone Exchange Building. The May Days, despite the fact that the workers were victorious on the streets, marked the end of the revolution. The workers’ unconditional withdrawal from the barricades at the behest of their leaders resulted in an implacable wave of repression that filled the jails and the labor camps (recently created by the Minister of Justice, García Oliver) with foreign volunteers, trade unionists, anarchists and members of the POUM. The Defense Committees were dissolved by the CNT leadership to prevent any further uprisings. At this point one can no longer speak of mistakes or myopia, but only of treason. The counterrevolution created two powerful instruments, the Espionage and High Treason Tribunals and the Military Information Service, and fostered the emergence of a system of secret prisons (Chekas) that were completely beyond the reach of the ordinary justice system. The Government was transferred to Barcelona. Berneri’s corpse was found, as was the mass grave containing the bodies of the libertarian youth of San Andrés, the CNT’s radio stations were shut down, the censorship completely purged the libertarian press, and the POUM was outlawed; there was a second provocation with the assault on Los Escolapios, Andrés Nin was assassinated, the control patrols were dissolved, and the Council of Aragon was abolished and the collectives of Aragon were destroyed by communist divisions. Special tribunals tried revolutionary workers, now branded as “incontrolados”: secret gravesites, the May Events, etc. The borders came under the control of the Central Government. All the collectivized enterprises and agrarian collectives would have to submit to new restrictive legislation, when they were not just returned to their former owners or directly nationalized “for strategic reasons” (as in the cases of the Transport and Communications sectors). With the Soviets commanding the People’s Army, the anarchist brigades were used as cannon fodder and sent to the front without sufficient weaponry or ammunition, and without artillery support or air cover, and were practically annihilated (the most flagrant case was that of the 83rd Mixed Brigade, the old Iron Column). Behind the lines, active militants were imprisoned in Chekas and tortured. At the front, anarchists who refused to join the PCE were shot with impunity on the flimsiest pretexts. Large numbers of soldiers were sacrificed in pointless battles like Brunete and Belchite, diversionary actions that failed to prevent the fall of the entire Northern Zone (Vizcaya, Santander and Asturias). The committees of the CNT and the FAI, which had created Defense Sections in their organizations, were fully informed about all of these developments, but, far from publicly denouncing this situation, they restricted their activities to bitter complaints in detailed reports they sent to the Prime Minister. The libertarian militants found themselves in the situation of having to choose between a fascist dictatorship and a republican dictatorship led by communists, and fighting fascism, no longer in defense of a revolution, but of an authoritarian bourgeois regime. Their press competed with the other tendencies in its expressions of nationalism, and the patriotic oratory of their delegates beggared belief. Demoralization inexorably swept over the masses who were fighting for the abolition of wage labor and classes. At the end of 1937 the descent into betrayal by the leaders of the Spanish libertarian movement was complete. Not only did they wage a campaign to impose their treasonous policies on the international libertarian movement, in which well-known figures like Rüdiger, Souchy, Leval, Lapeyre, Lecoin, Rocker, etc., proved to be very useful, but they constantly pleaded for a place in Negrín’s government and ignored the repression that was decimating their rank and file membership. Their former ideology was formally and definitively abandoned at an economic plenum held in January of 1938 and in their subsequent pact with the UGT. They advocated a democratic and federal republic whose constitution was supposed to be approved by the Spanish people once the war was over. The government crisis that removed the defeatist Indalecio Prieto from power also resulted in the CNT obtaining a Ministry in the “Government of Victory”. The negrinismo and pro-communism of the National Committee of the CNT were so extreme that they provoked major conflicts with the Catalonian Regional Committee and the leadership of the FAI. After the debacle of the battle of Teruel everyone except the National Committee was convinced that defeat was inevitable. A combined plenum of the three organizations of the Spanish Libertarian Movement, however, reaffirmed its support for its leading committees and expressed its support for resistance to the end, draped in the “Thirteen Points” of the Prime Minister, as opposed to the defeatism of the sector that was opposed to the anarchist bureaucracy that was hoping for another “Convention of Vergara” arranged by the United Kingdom. CNT leaders participated in a government that executed many CNT militants during the subsequent wave of repression. 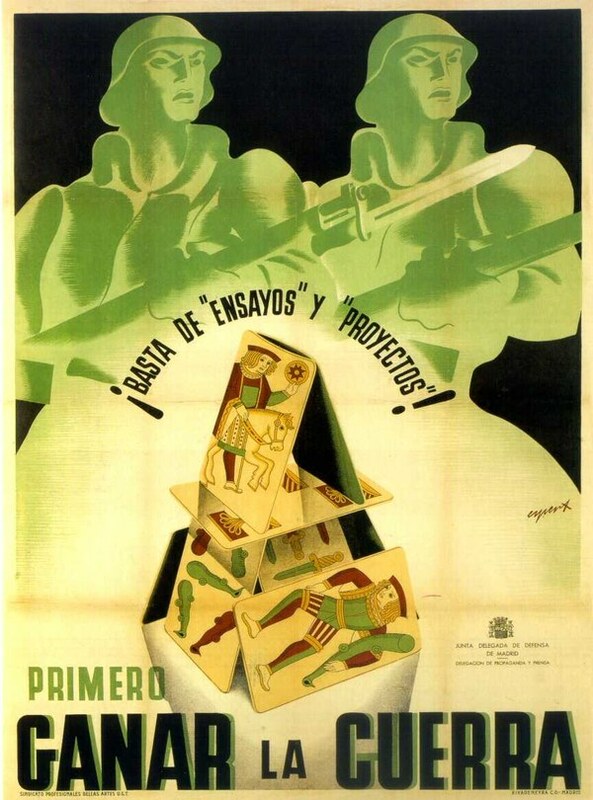 Finally, the fiasco of the last great pointless battle, the Battle of the Ebro, along with the withdrawal of the International Brigades, undermined communist influence and allowed the sectors that felt that they had been mistreated—the non-negrinista socialists, the republicans and the anarchists—to begin to coalesce. A vain attempt was made to break the neutral front of the so-called “democratic” countries. A series of appointments that granted a decisive majority of the military commands to communists, accompanied by the resignation of the President of the Republic, prepared the ground for a counter-coup led by colonel Casado, who put an end to the dictatorship of Negrín and the PCE. In the blink of an eye the feeble resistance offered by the communists was crushed, but Casado and the National Defense Council were unable to arrange an honorable peace that would spare the Spanish people from the imminent bloody massacre. The end of the war entailed a multitude of sufferings for the defeated, at the mercy of a victor who was thirsting for vengeance if they stayed in Spain, or residence in concentration camps if they managed to escape the country. The postwar period was terrible for the losers; the ruling classes behave cruelly when they win, and they are also cruel when masses of refugees come begging.